Right now, i am playing Winning Eleven 2010. Looks like almost 100 hours that i'm playing when i saw Track Record. For some reason, i should editing some players for any teams. But only abilities, special abilities, positions and appearance. As well some ages will be updated in future. EDIT: Just one more thing, I only play PS2. So today I decided to feck my usual playing routine and decided to play Mario Kart Double Dash on dolphin for an hour. It was a lot of fun, like always. There are a lot of concepts I really loved about this game, such as 2 people to a kart and special items. So, anyone who still playing any games? I was playing Gran Turismo 5 last night. I have been messing about with the PS2 lately using OPL and playing Revolution as a test using a widescreen patch. I also tried out Aggressive Inline as it's been years since I played it. I’m going to play Ikaruga later this day. Super looking forward to that!! Yes, I went back to playing Rayman Origins now and I've actually made some progress and I love it! I've unlocked the revisit worlds and I've already saved one of the four kings from their monster form (Carnivora in Ticklish Temples). I was playing Legends on PS4 co-op with my friend the other day also and we were having a few beers. I still have to finish it and I also want to replay Origins too as I really like the game. Used DOSBox yesterday to play Operation Neptune, a math educational game from the Learning Company. It reminded me of the fun i had playing educational games as a kid, and I played for an hour despite the fact that my original intent was to test DOSBox with some old game files I had downloaded. I've been playing a lot of Super Smash Bros Ultimate lately and it's actually(not counting a demo for Smash 3DS) the first game I'm playing in the series, the gameplay is so unique to other fighting games with its precentage meter and platforming elements and it's just the most addicting fighting game experience I've had since maybe Tekken 5 on the PS2. I'm a bit late to the party with this once, but I've also started playing BOTW, it's probably one of the first open world games that I've really gotten sucked into. BOTW really is amazing. I still never finished it completely, but I put crazy hours into it nevertheless. It's really addicting once you get into it. I have PSP, it was long time, 2 years after the battery is dead. so i unplug Battery pack, because i still have AC Adapter (Acer Pocket PC), and it works. In that case, i did backup my saved data for psp, so i put it on PPSSPP Emulator. So anyway, i think PSP can play PS1 Games i guess, for some reason i used CWCheat even nothing to solve game for 100%. EDIT: I updated Software Version to 6.61, which it was last version, so i decided play some games (maybe if is Puyo Pop Fever, or even PES game). I've been playing Xenosaga Episode I on the PS2 ever since I picked it up at a local game shop a week ago, I find the game to be pretty interesting. I keep learning new abilities I can achieve within it. I decided to go ahead and pick up Xenosaga Episode II and Episode III while I was at it, and finally get a proper high quality RGB SCART cable for my PS2 instead of using the PS1 SCART and the set of component cables I had. I downloaded Burnout Paradise Remastered via EA Access on Xbox One X because I remember I used to play it on PS3 years ago. I think it really is a very fun game. Also, I'll be getting the Burnout games for PS2 and Original Xbox. I am currently working with my project called: Winning Eleven 2010: LWA Edition, so this means unofficial edition. I burned this game then i test on my ps2 console, Works perfectly, some music playlist would stop if is glitched red laser reading data. By the way, i used Audacity to dump Little Witch Academia: Chamber of Time Japanese Voice, so i mix the Commentary and Voice. I did play Become a Legend Mode, probably i should doing my best. I was playing Super Bomberman R because it was free with Xbox Gold. I just cleared the main story and got back to playing Burnout Paradise. I have decided to return to my roots with Rayman and start again from Rayman Advance. Sure not a good port, but it's where I first experienced the fun of both Rayman games and gaming in general. 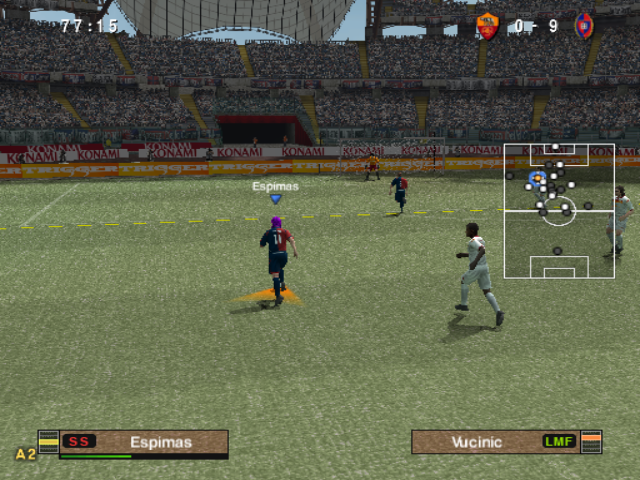 Now i did play Winning Eleven 2010 LWA Edition, whereas i did modded the position to change font using Rayman 3.
as i wanted more. But while i don't know, i just going create or edit player in future years as i want to know. I imagine I will do much worse in the other versions. It doesn't matter how many times you die as long as you complete the game. I'm sure plenty of others including myself would die more than 25 times in the PS1 version unless they're speedrunners that play it all the time. I'm just happy enough to be able to finish it without using a continue, I might actually play it now. I was playing some Rayman 3 earlier today and tried to beat SBTC, but at Part 2, because of the snowballs and me not being able to get good combos, because I had enough time to manipulate an image, I decided that I will complete it on Saturday and did the image manipulation today.